I had a conversation the other day with a good friend who was talking about an example of middle school students who needed an adult to “hammer them”. That didn’t mean berate or mistreat them but rather let them know that their actions were not acceptable and that they could be punished for the way they were talking and acting. Too often adults think that being permissable is the way to let kids know you trust them. There’s just one problem, they aren’t trustworthy. They are earning that just like you do with any new job you start or volunteer position or neighborhood. You must gain the trust of the others by showing you understand how to interact with the people around you. The written rules (or unwritten maybe) are not there to squelch your freedom but to guide the freedom we all have so that we can all enjoy living along side each other. That prompted me to think about things that we as adults need to shift in the way we interact with teenagers. 1. Stop telling them to be who they are. They have no idea who they are! What this really comes down to is creating space for them to explore who they are in a safe, loving environment. Have a conversation, talk through how certain choices will help them be a better version of themselves each and every day. Read about historical figures who didn’t know who they were until late in life. This will help a teenager understand that the urgency they feel to know the meaning of their life by the end of high school is instead something they will be working on years into their career, or a second or third career. The world of America’s Got Talent and The Voice will never be reality for the vast majority of us. 2. Teach them how to make intentional choices, not emotional decisions. When my wife and I were getting engaged and I asked her to marry me she said, “No.” Wow! I did not see that coming! But then within 30 minutes, she had calmed down and let me know she just got really nervous and emotional, and she did want to marry me. I’m so thankful because 16 years later I’m a better man for it! We both questioned what that meant and had some very good mentors tell us it was part of making the intentional decision rather than relying on a “lovey” feeling to hold us together. This mindset applies to lots of other situations too. 3. Realize you are coaching, not training, by the time your child becomes a teen. I love Andy Stanly’s timeline for parenting that says at 13 you have taught your child everything you can, and it’s time to begin moving out of the way and start coaching your teen in the right direction. If you didn’t teach them the way to make good decisions before 13, your role still shifts from enforcer to coach. The up side here is that this approach can lessen your stress as a parent if you let it. These 3 suggestions come not from parenting for me but from our support groups which is different. What I do know from parenting and from personal experience is that these 3 principles, paired with other adults willing to help your child by coaching them in the same way you will, can be the difference between them becoming a succesful adult or not. 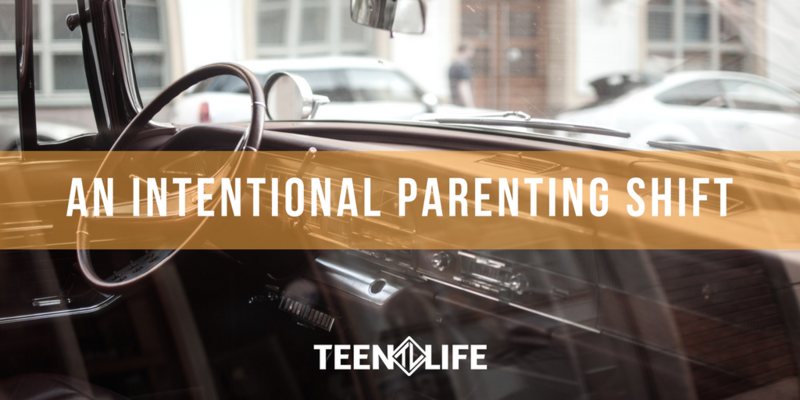 How have you intentionally shifted your parenting to reduce your stress and act more long term with your teen?